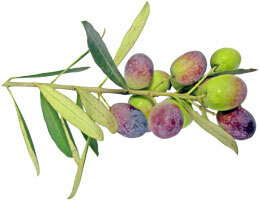 On account of its content of oleic acid and of the antioxidants, polyphenols, sterols, and vitamins, good olive oil has a positive effect on diseases, as diverse as cardiovascular diseases, diabetes, cancer, obesity, rheumatoid arthritis, skin diseases, high blood pressure, ageing, cognitive decline and senile dementia. It contains high levels of natural antioxidants (especially Vit. E). Antioxidants serve to scavenge and detoxify the harmful free radicals in our bodies. Thus it serves as protection against premature ageing and other degenerative diseases such as cardiovascular and circulatory diseases, inflammatory conditions e.g. arthritis and certain cancers including breast, colon and gastric cancers. It helps to control cholesterol levels in the bloodstream. High cholesterol levels are linked to heart disease and atherosclerosis (fatty plaque build-up in the arteries). It contains a particularly high content of beta-sitosterol, a substance which counters intestinal absorption of cholesterol. About 75% of the fatty acids in olive oil are monounsaturated, which decrease the levels of LDL (“bad” cholesterol) and maintain, or even increase, the levels of HDL (“good” cholesterol) in the bloodstream. It contains the ideal balance of the essential omega-3 and omega-6 fatty acids, which is important for a healthy heart and circulatory system. Olive oil is easily digestible (unlike other fats and oils) and aids in the assimilation of minerals and vitamins. It has a healing effect on the stomach and intestines, preventing gastric ulcers. A natural and healthy way to correct chronic constipation – take 2 tablespoons of olive oil on an empty stomach early every morning. It has been shown to be beneficial in the action of the gall bladder, and in the prevention of gall stones. It stimulates bone mineralization, so preventing calcium losses and osteoporosis. It has been found to afford better glycaemic control and improve coronary risk profile in non-insulin-dependant diabetes patients. Unlike seed oils, olive oil remains stable at high temperatures, owing to its higher resistance to oxidative deterioration, thus making it most suitable for deep frying. Also studies have shown that olive oil remains on the surface of the food unlike other oils that penetrate most or all of the food. If filtered properly after use, olive oil can be used up to 10 times for deep frying, thus making it very economical. with Extra Virgin Olive Oil in it, is very popular due to the extraordinary characteristics of good Olive Oil. Olive oil also combats free radicals and prevents the breakdown of hyaluronic acid, which is found in all living organisms and gives skin a healthy appearance. When absorbed the squalene (normally found in sharks) present in Olive Oil, protects the cholesterol in the corneous layer from oxidation and this protection is similar to that provided by retinoic acid and carotene. 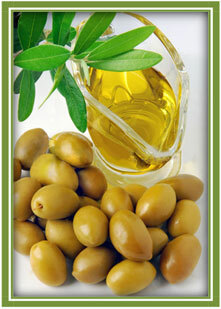 It is believed that Olive Oil is possibly the only vegetable source of squalene and squalane. Squalene and squalaneare highly valued for their ability to rejuvenate dry skin and are common in anti-aging wrinkle creams.